Month: March 2015 - ThirtySevenWest ThirtySevenWest - Creative ideas about personalized custom ribbons, woven tags and labels, personalized gifts and more!!! You’ve finally found that perfect sweater. You can’t believe how great it draws the color of your eyes and flatters your figure, plus it just looks simply smashing with practically everything you imagine combining with it, right? Fabulous! But after the first time you wash it… tragedy. The color bleeds, frayed “unknown” strings appear all over it, and its generally wretched appearance means that the sweater that you loved and paid “way too much for” (as your husband likes to remind you) gets relegated to the pile of clothes that are only fit for “at home” wear. If you had only known what those weird hieroglyphics and symbols meant on the garment care tag, your beloved sweater would still be an integral part of your wardrobe… not the doggy blanket it’s destined to become now. If this has ever happened to you, you’ve probably learned the basics of garment care symbol-ology, but in an effort to prevent future fashion catastrophes, we’ve compiled a simple list of the coded language that’s included with all fabrics. In addition, for all of you aspiring fashion designers, we’ve included a few links to industry resources that can help you decide on the right symbols for your own garment care label creation. Every garment includes care instructions. But knowing exactly what those instructions mean can be tricky. The first thing you need to know are the signs… there are 5 basic ones. Square shape. Squares indicate the drying instructions, and again, the additional lines and markings add further information about proper drying practices. Triangle. This symbol is used to indicate bleaching permissibility, but why a triangle, I have no idea. Iron symbol. This shape looks like a household iron. Circle. This symbol is used to indicate whether or not the garment can be dry-cleaned. 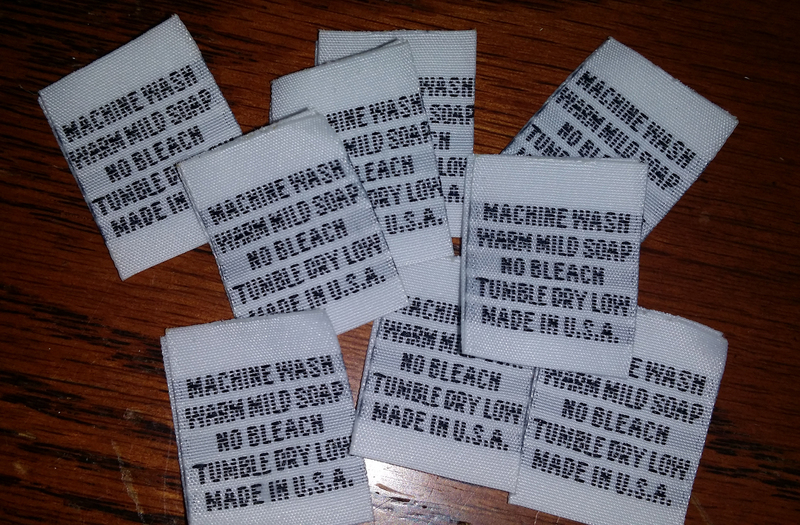 And now that you know the basic shapes, let’s look at what the additional markings mean on garment care tags. The dots contained on the symbols indicate the maximum temperature you can safely expose the garment to. Logically, one dot means low heat, two dots mean medium heat, and three dots (that’s right, you guessed it) mean high heat. These rules are the same for ironing, washing, and drying your garment. Lines are a little trickier. When lines are placed beneath the machine wash and drying symbol, they indicate the appropriate setting on the machine. One line placed below the washing symbol means permanent press, and two lines mean the gentle cycle is required. Likewise, on the dryer symbol (square), a single line indicates the permanent press setting and two lines mean the gentle cycle. This requires a little more brain power… but not much. There aren’t any filled shapes in the machine washing symbol, but for drying and bleaching, filled sections mean a lot. The square with a darkened circle in it means that no heat can be used when tumble drying the garment. You can imagine it like a giant dot that means no heat. The same is true for a darkened triangle (most times including an “X” through it), it means you cannot bleach the fabric. However, diagonal lines running through the triangle indicate color safe bleach is OK. If the symbol is crossed out with an elongated “X,” this means that you can’t use that type of care for the garment without incurring damage. A machine wash symbol with a hand shape means only hand wash—don’t machine wash.
An iron with an “X” covering the lines coming from the bottom of it means don’t use steam when you iron. A square with a curved line in the top of the shape means line dry. A square with three vertical lines inside means drip dry. Protecting your wardrobe or the life of your fashion creations is easy once you know how to decipher the garment care instructions contained on the tag. Visit one of the many industry resources to learn more about these symbols and how they can help you keep your clothes looking new!